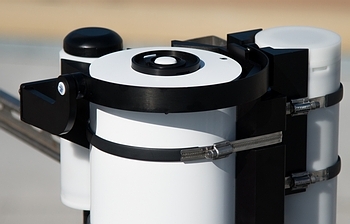 GUVis-3511 radiometer (center) with BioSHADE drive (white cylinder on the right) and BioGPS (black dome in the background).The GUVis-3511 radiometer is the latest version of BSI's GUV series of ground-based instruments. The GUVis-3511 is available with as many as 19 channels, which can be selected from 30 wavelengths, ranging from 305 to 1,640 nm. The radiometer can also measure Photosynthetically Available Radiation (PAR: 400-700 nm). The electronics of the instrument are based on BSI’s microradiometer technology, which features unprecedented performance with respect to dynamic range, linearity, speed, and expandability. The instrument also features a new irradiance collector covering the spectral range from the UV to the infrared (IR). The instrument can be equipped with a shadowband accessory, the BioSHADE, which allows alternating measurements of global (sun + sky) and diffuse solar irradiance. These measurements allow the calculation of direct solar irradiance. GUV radiometers were introduced in 1992 and are being used to monitor geographic variations in national and international networks. Similar to its predecessors, the GUVis-3511 is suitable for use in long-term research programs. Depending on configuration, the GUVis-3511 affords the retrieval of aerosol optical depth, cloud optical thickness, total column ozone, and water vapor column — four crucial variables used in characterizing the solar spectrum. Measurements with a GUVis-3511 radiometer during the Great American Eclipse of August 21, 2017 are featured here. A publication is in preparation.